Laura's Experience with training dogs. Laura's early work with German Shepherd dogs taught her the importance of being a strong leader. It is much more to Laura than just sit, down, heel and stay. It is the little things that make a difference. Respect of body space, respect of door ways, having a dog that accepts restraint and handling and gets along with other dogs and people. Home management; practical ideas to teach the pup to be good in the house and yard! 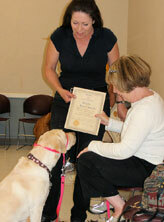 This class is much more obedience-oriented than is typical of puppy classes. We start with treats and positive reinforcement to teach Come, Sit, Down, Heel and Stay. As the dogs get more consistent, we start to wean off of the food as a main lure and reward and teach you how to use your voice and leash to back up your words. As a result we get a lot more done in the five week course than is typical of most puppy classes. The best investment you'll ever make in your dog. I feel fortunate to have this class available for our clients. The feedback has been continually positive." Impressed, relieved, grateful, ecstatic...I can certainly see the results achieved." I have been referring clients to Laura for over twenty-five years! She has helped hundreds of my clients raise well behaved house dogs that are a joy to their owners. I love her classes as they are smaller than other organizations and she teaches specifically how to greet other dogs while on a leash, a common concern owners have. It is a great help to me and my staff to have patients that are easier to examine and treat!" 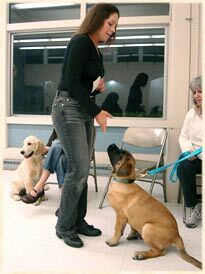 I have watched dog trainers all over the world and Laura is one of the best...a pearl of wisdom for dog owners." To Laura it's more than training a dog, it's teaching the owner to understand how their dogs are thinking. Do yourself and your dog a favor and give her a call." Laura combines her obvious love for dogs with energy, skill and expertise providing classes that are educational and fun. A valuable resource for all who desire a well-mannered, socialized and responsive dog." In twenty years of referring to Laura for Dogs she has been providing the best service for behavior and discipline for both puppies ad adult dogs in the Bay Area. I have been very pleased with her results!" Long regarded as one of the top dog trainers in the Bay Area, Laura's expertise comes from her many years of work in the companion dog training field. Come and see how she projects a joyful classroom environment where your pet and family can learn long term training and coping skills. Whether participating or observing, you will be struck by the ease and naturalness of the training process and the sheer fun of her methods. Bay Area Veterinarians have been recommending her classes to their clients for over 35 years. She is a past member of the Delta Society and has evaluated dozens of dogs over the years as a Certified Animal Evaluator for Pet Therapy Programs. Laura has been a certified AKC Canine Good Citizen Evaluator with the American Kennel Club since 1992.